Last night, the tech industry was treated to two new smartwatches from LG and Samsung, the G Watch R and Gear S. Both will go head-to-head with the Moto 360, a watch that is easily the most anticipated in the history of smartwatches, thanks to its round display. It’s a good time to be a smartwatch watcher. We aren’t sure what has taken Motorola so long to release the 360 or provide us with official details on its features, but in that time, LG managed to create and unveil their own round watch, while Samsung attempted to do the same. The Moto 360 should still hit store shelves before either of those, though, so we wanted to put it up against the other two, to help you decide if it is still the watch for you (most of you are saying it is) or if waiting it out is the better option. 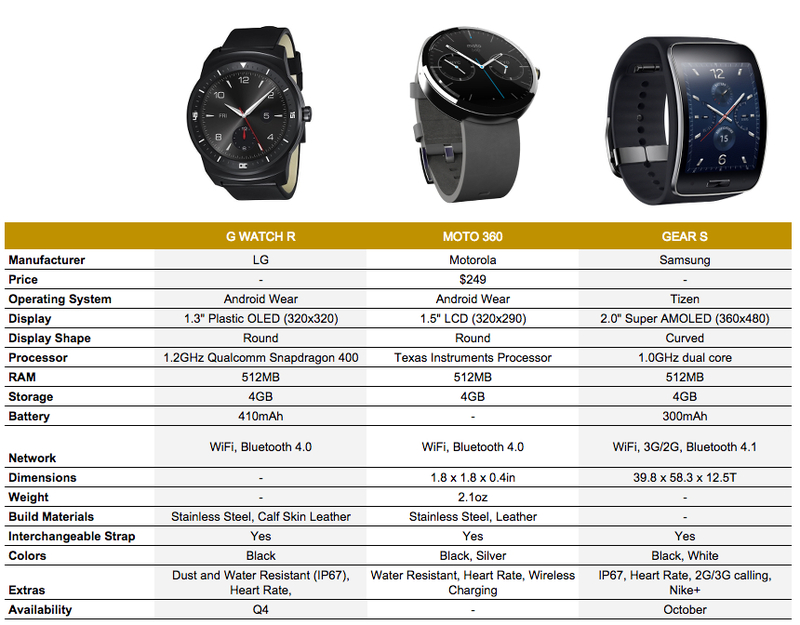 We have official info on both the G Watch R and Gear S, along with plenty of details on the Moto 360 through a premature Best Buy listing, just enough to for a quick comparison chart. Certain items are obviously missing, because each manufacturer has either withheld certain specifics from us or still hasn’t made it all official. Speaking of official, keep in mind that the Moto 360 information was again, taken from the Best Buy leak, so things could/may change.